The Lough Neagh Partnership has funded a number of major improvements around the Lough including : Biodiversity and Wetland Restoration; Marinas/Quays and Visitor Centres: Historical and Promotional material ; Boating, walking and cycling: Heritage sites and buildings and other projects. The Borough of Antrim has something for everyone. Its central location, high quality tourist accommodation, superb leisure and retail facilities, rich tapestry of history and friendly welcome make it an ideal base for visitors to Northern Ireland. Situated at the north-east corner of Lough Neagh, the Borough has an abundance of forests, rivers, trails and woodlands. The Borough of Antrim is a scenically beautiful area with a number of picturesque towns and villages. If times past interest you, then you will certainly not be disappointed by the variety of heritage sites. When you are in the area why not take the time to discover Antrim's hidden treasures such as The Holestone, Donegore Motte, Pogue's Entry Historical Cottage or Springfarm Rath. Antrim Castle Gardens feature one of the last remaining early 17th century Anglo-Dutch water gardens in the British Isles. The site contains many exceptional features such as an ancient motte, ornamental canals, round pond and parterre garden as well as remnants of Antrim Castle. 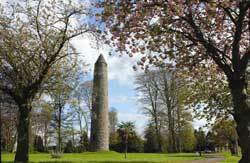 Antrim Round Tower was built around the 10th Century and is one of the finest of its kind in Ireland. 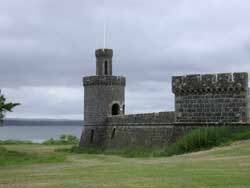 It is 28 metres tall and was built as part of a Celtic Monastic Settlement. 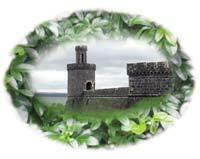 Shane's Castle is the family seat of the O'Neills of Clanaboy. The Demesne is one of the most beautiful and well maintained in Ireland. Although the Castle has been in ruins since the fire of 1816, the remaining structure, including a unique Camellia House, is a striking feature on the landscape. Churchtown Point, Cranfield, with its 13th century ruined church and holy well, attracts visitors from far and wide. 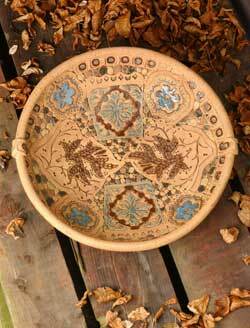 Within a few yards east of the church is a holy well, which produces fine spring water and amber coloured crystals. Where the waters of the Lough lap the shore you'll find the Lough Shore Park. In the summer months, the Park hosts a variety of events, including a Viking Boat Race on 2nd July. The attractive surroundings make it the perfect spot to spend a few hours enjoying a picnic or feeding the swans. Between Easter and September, there is an on-site caravan and camping park with laundry facilities, café and visitor information service. For an activity-based holiday, some of the finest sporting and leisure activities in Northern Ireland are on offer. Cycling the Loughshore Trail and sailing at Antrim Boat Club ensure that the more energetic visitor always has something to do. With a choice of indoor and outdoor facilities there is something for everyone at the Antrim Forum. The completion of a major refurbishment programme places the Forum at the top of the league for sports and recreation. Visitors can enjoy an enhanced range of high quality facilities including a state-of-the-art Fitness Suite, Ten-Pin bowling and a soft-play adventure area as well as the existing facilities. Golfers of all handicaps from throughout the world continually visit the Borough of Antrim golf courses. Dramatic challenges and delightful scenery make each round memorable. Golfers are well served with courses at Allen Park Golf Centre, Hilton Templepatrick and Massereene Golf Club. There are many delights awaiting the visitor on a trip to the Borough of Ballymena. Particularly attractive for shopaholics, this is a town with a reputation as a first rate retail centre, selling locally produced crafts, ceramics and jewellery. If you are keen on sport and leisure activities then place Ballymena first on your list. We aim to provide as much as possible to suit everyone's taste. For the more outdoor orientated there are various options including horse-riding, golfing, fishing, walking not forgetting the indoor facilities available. All our rivers, namely the Bann, Braid, Clough and Glenwherry have fine runs of fish. Whilst the People's Park boasts a well-equipped children's playground, tennis courts, bowling green, toilets, lake and picnic area. Patrick when he was captured and first brought to Ireland in the 5th Century. 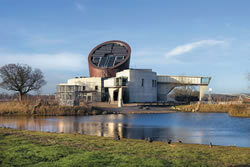 The ECOS millennium environmental centre on the Broughshane Road promotes the benefits of a sustainable future, the park features a Visitor Centre with a multi-media show, an organic garden, wind turbine, woodland, picnic area, kiddies play areas and a touring caravan park. Sited in the Showgrounds beside the ECOs Centre is the Northern Ireland's second largest agricultural show - the Ballymena Show and Countryside Festival (see www.ballymenashow.co.uk). The picturesque villages of the Borough are popular with visitors for their magnificent floral displays, Moravian and mining settlements and significant historical interest such as the Moat at Harryville along with a marina at Portglenone encourages visitors to use the River Bann for leisure activities. Visitors and residents of the Borough are invited to visit these attractions. A great starting point is the Tourist Information Centre, Church Street and the Ballymena Museum, Wellington Court. Both premises provide a wide range of information for the promotion of the area. Magherafelt District - "My 'place of clear water' the first hill in the world where springs washed into the skinny grass"
There could be no better place to unwind and refresh than Magherafelt District. Spanning the valley of the River Moyola, from its source in the Sperrins to where it empties into Lough Neagh, the diverse landscape, rich heritage, natural beauty and thriving plantation towns of the area offer the visitor a unique insight into real rural life in Northern Ireland. As the gateway to the Sperrins, Heaney's 'clear water' of the Moyola and the shores of the lough, make this countryman's heaven at its very best. There is a wealth of exploring to be had in the area. Steeped in history the District has many relics of the past scattered throughout its diverse landscape. There is the Tirnoney Dolmen, St. Lurach's Church, Tirkane Sweathouse, Bellaghy Bawn, the Plantation Centre, Church Island, and other areas of Special Scientific Interest, to name but a few. Take time to indulge in one of the many activities on offer. Anglers will appreciated the championship standard fishing pegs on the River Bann at Portglenone. Walkers will enjoy the choice of challenging walks through splendid scenery and landscapes. Golfers can sharpen their skills at the Tobermore Golf driving range before embarking on one of the quality courses in the area. There is also the option of cycling, bird-watching, and unwinding in the one of the districts leisure facilities. Each year the district plays host to numerous events, from hot air balloons brightening up the skylines in June to the FIM World Motocross Championship in September. Other events include the Pineapple Carnival, Glasgowbury Music Festival, vintage rallies, community festivals and traditional country fairs. In the evening enjoy a pint pulled by Northern Ireland's 'Pub Personality of the Year', take in a movie at the multiplex cinema, or relax and unwind in one of the many pubs and quality restaurants on offer, and experience mouth watering cuisine combined with the best of Ulster 'Craic'. Be assured that when you visit the District of Magherafelt you will feel the warmth of the local welcome by day and by night. For further information on the District of Magherafelt and what it has to offer contact Magherafelt Tourist Information Centre Tel: 028 79631510, E-mail thebridewell@magherafelt.gov.uk or visit www.magherafelt.gov.uk. Dungannon and the chance to sample a "Flavour of Tyrone"
Spark is a community of craftspeople who work in the two beautiful counties of Tyrone and Donegal. Over the last number of years the popular Summer School circuit has amply covered the subjects of literature, politics, history and culture. The organisers are keen to point out that this event is open to everyone It is not an O'Neill Clan Gathering but an opportunity for the public at large to interact with all kinds of people and discuss subjects of both historical and topical interest. For further information contact Christine Doherty at 02894 472242 or see www.oneillsummerschool.com. It was felt fitting that the final quote on the attractions of the Lough and the Lough Neagh Festival should be left to Jim Wilson MLA, whose South Antrim constituency borders the lough. Jim is an avid angler and a keen supported of all countrysports and the rural way of life. He has played a pivotal role in bringing the Country Lifestyle and Lough Neagh Festival to Shanes Castle. "For those who have not yet fallen under the spell of the great outdoors what better place to start than at this festival with such a variety of spectacles and events to whet their appetite for a lifestyle not yet sampled, and where better a setting than on the shores of Lough Neagh, an area steeped in history and natural beauty?"